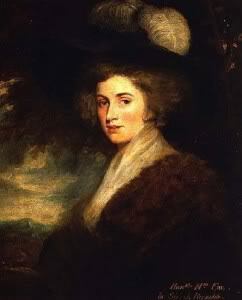 Elizabeth Cane was born July 11, 1750. Few will recognize the name but she was to become one of the most fascinating and notorious women of the century. Little is known about her early years but it is likely that she came to London when about sixteen, and either became a hairdresser or a hairdresser´s model. The one thing which is clear is that her talents extended far beyond a spot of back-combing, and within a few short years she had transformed herself into Elizabeth Armistead, high class courtesan and confidante of the Prince of Wales. She was one of the richest and most celebrated beauties of the Age – with a string of lovers from the upper echelons of the aristocracy. Two Dukes, an Earl, a Viscount – and the Prince of Wales – all succumbed to her charms. And each in turn lavished her with jewels and expensive gifts. She knew her worth, and certainly was not going to waste what she had on one man alone. That is, until she was 33 and met the charming and enigmatic Charles James Fox. The Whig aristocrat was a couple of years her senior, and their love affair was to scandalize society and prove that love could overcome all obstacles.